For Those Who Have Gone Before Us – Run. Ride. Roam. The day started with a morning walk in the dark, across the dew saturated grass, to the campsite bathroom block. Once there, I implemented my now fluid routine for getting my token in the slot, before jumping under the water. This shower was going to give me 7 minutes of running water for my token, so I got ready, raced to the machine at the other end of the bathroom, put my token in the slot, raced back to the shower where the water had started running and my seven minutes were ticking away, turned the temperature up full whack and jumped under the spray. Everything that needed to be done, got done with some time to spare, so I stood under the thin spray, with my remaining water until…Clunk, the water stopped. That was my 7 minutes and I’d had it! “Seven o’clock,” I announced in a chipper tone, to let him know that it was getting up time. He emerged feet first, then unfolded himself out of his cramped space and sat down, while I presented him with his breakfast and mug of coffee. The morning routine was now in full swing! We packed up the soaking wet tent, which hadn’t dried from its covering of dew and we pedalled off in the direction of Iepers (Ypres). 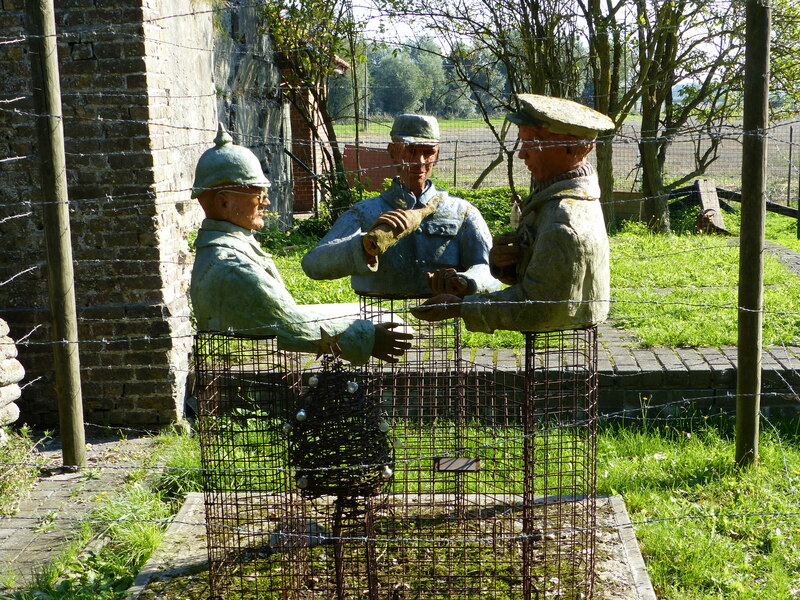 We are in the area of many battles from World War One and our ride took us past many different monuments and reminders of the conflict. 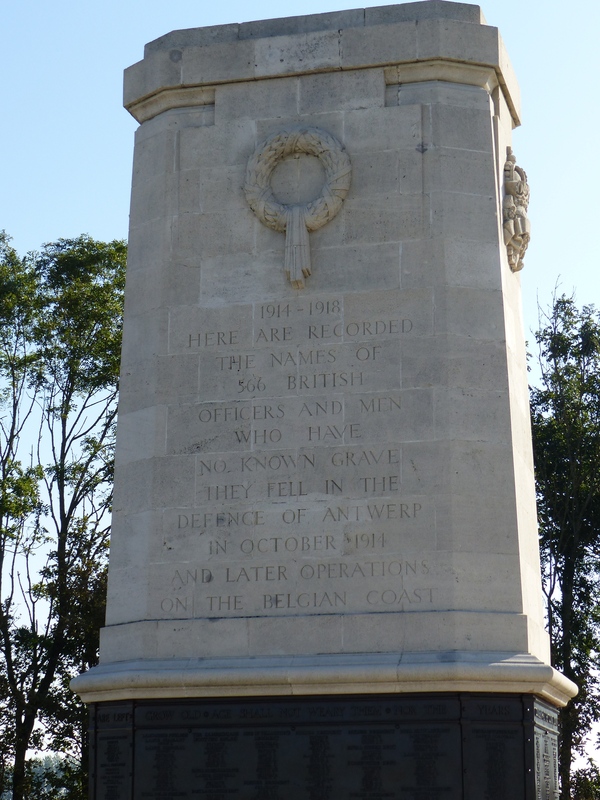 The first was in Nieuport, which had a memorial to the British officers who had fought in the defence of Antwerp and along the Belgian coast and who had no known grave. Behind it stood the huge and quite grand looking monument to King Albert, who had been the Commander in Chief of the Belgian army during the war. 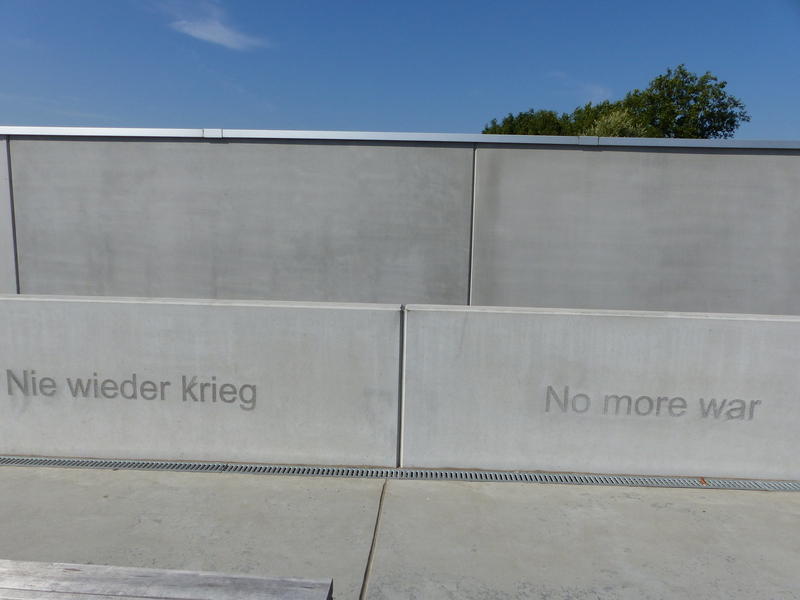 We stood and read the plaques and information boards and looked at these imposing structures that were, like those we had seen in France, a thank you from an invaded country, to those who had played a part in its defence and liberation. The ride on from there was so good. The sun shone, the path was flat, away from traffic and through the countryside. We stopped for elevenses on a bench, looking across the fields, soaking up some sun and greeting the many cyclists who wheeled past. 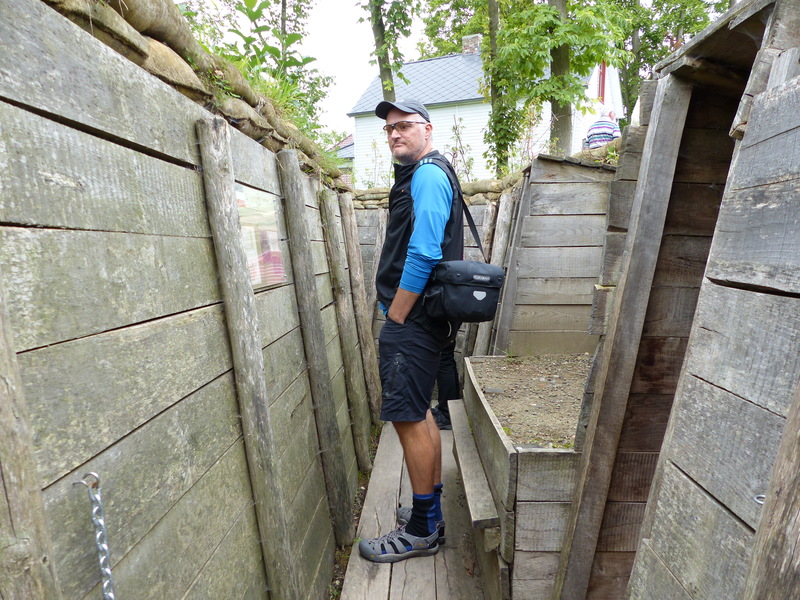 The path was an old rail line and I later learned it was the Belgian front line during WWI. 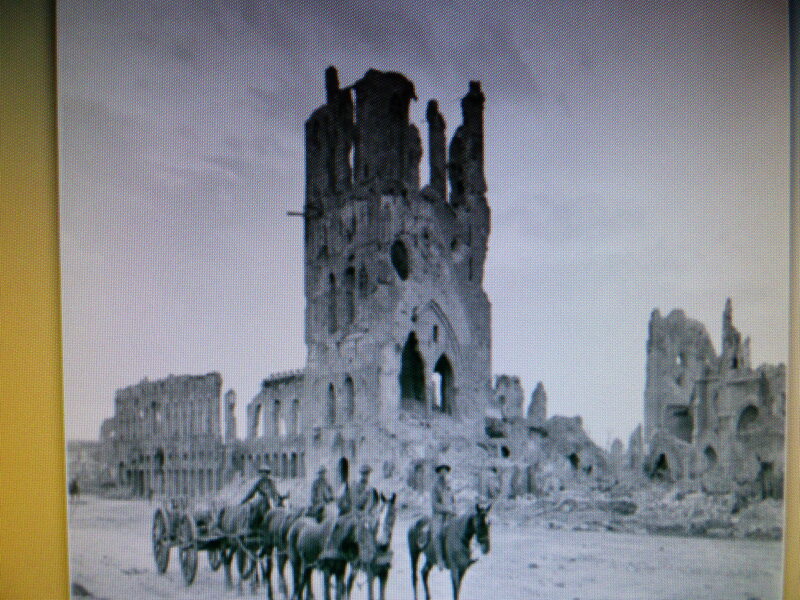 Riding along, I looked around the landscape and imagined it as it would have been 100 years ago. 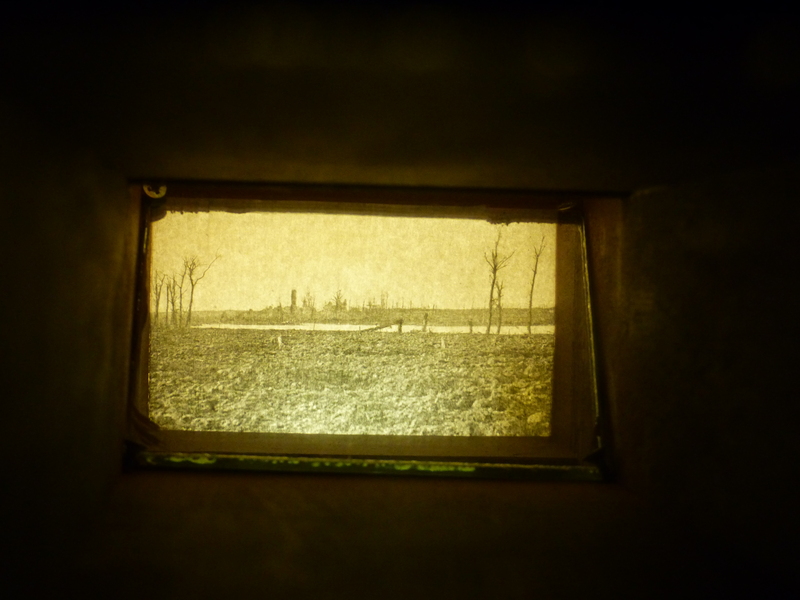 It wasn’t hard to imagine, especially as so many of the fields had been ploughed and the dark, rich, rolls and clods of soil that spread before us, did in fact look similar to the images I’d seen, of treeless, shelled landscapes. I rode along in the sun, thinking of what had gone on in that area and thinking, not for the first time, how lucky I was. I thought of what others had endured and what I was experiencing, with freedom and free from conflict and fear. Something I too often take for granted I think, but need moments like today to remind myself of those things and be consciously grateful for what I have. We took a detour off the path to ride into Diksmuide. 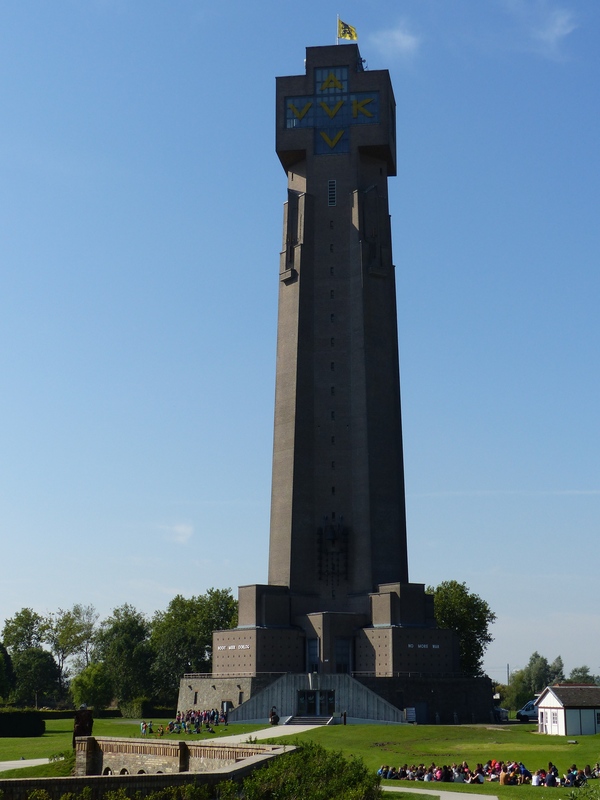 Here I had wanted to see the Yser Tower, which is essentially a monument to peace. 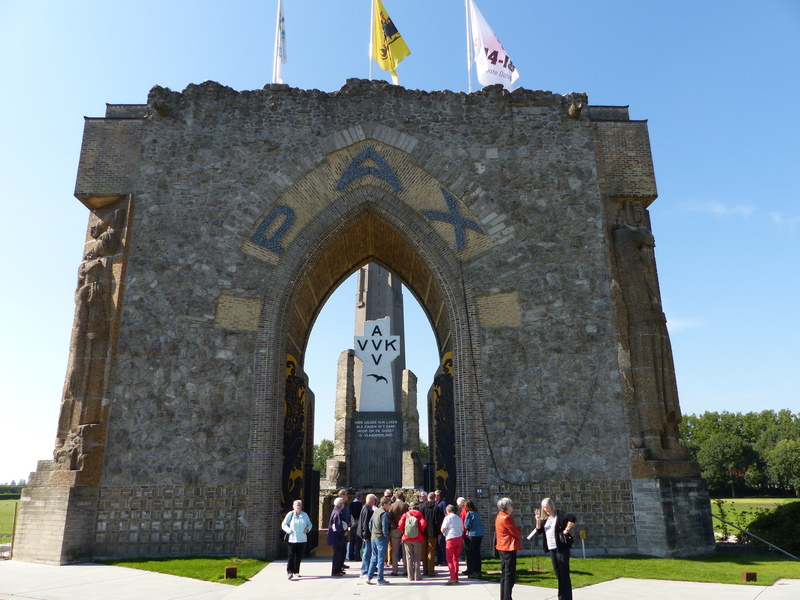 The letters on the tower AVV-VVK mean Alles Voor Vlaanderen – Vlaanderen Voor Kristus (Everything for Flanders – Flanders for Christ), and of course Pax means peace. It could be seen from a long way in the distance and its message should certainly be spread far and wide. Many other smaller monuments and memorials, sat alongside the path as we rode on. It was a continual reminder of the significant events, history and stories of this region. 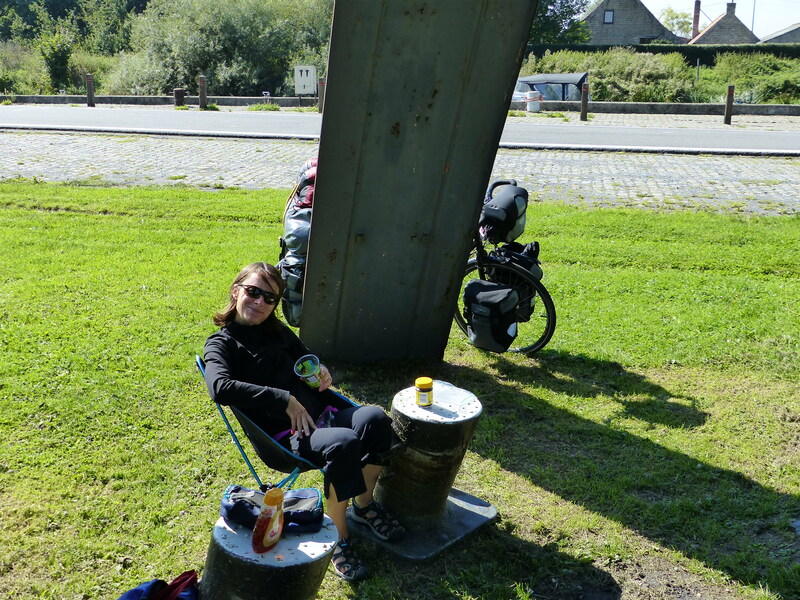 We stopped for lunch in the sun again, put the tent out on the ground to dry out from this morning’s damp and enjoyed our bits and pieces beside the canal and fields. Iepers appeared and we rode into the beautiful town square, along the cobbled streets and with the gorgeous buildings all around us. We had decided to stay in the city centre, so we could explore, so we found our chosen hotel, parked the bikes in the storage room, settled into our room and then headed straight back out the door. 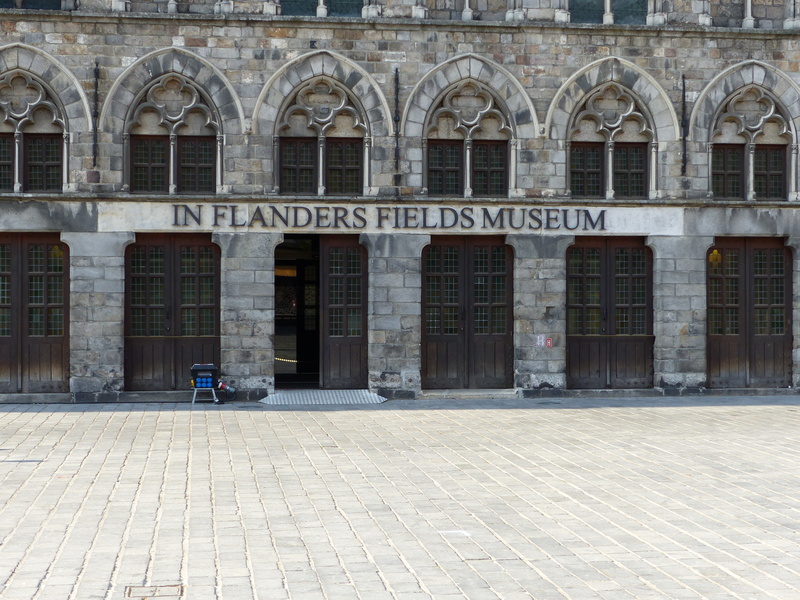 First stop was the In Flanders Fields Museum, located in the Cloth Hall. 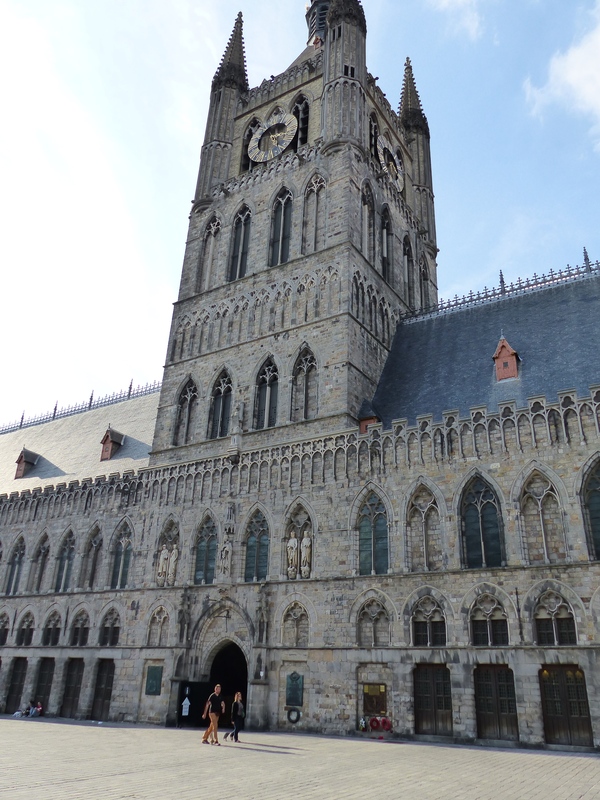 Ypres was a go-to place for me because my grandfather fought here in World War One and after seeing some of the other places he had been in France, I wanted to walk in his footsteps in Belgium too. The museum was excellent, with much of the same information and artefacts we had seen in similar museums, but so interesting to see and read information from the Belgian perspective. 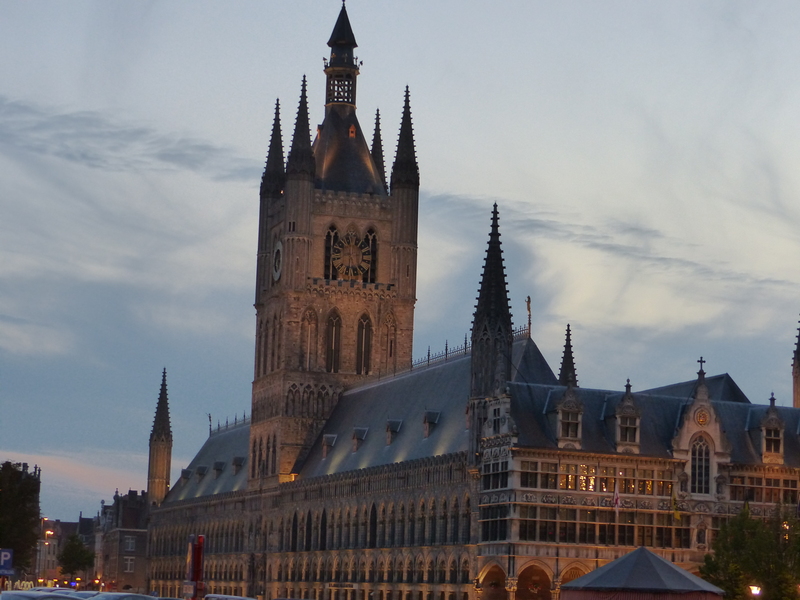 I learned more about pre-war Belgium and the effects of the war on the civilian population. In some ways, the information, videos and audio commentary were some of the most graphic I’d seen or heard in a museum. The descriptions from the medical personnel, were very raw and quite confronting and it gave another layer to the story of this conflict and the damage it did. I had my grandfather in my mind the whole time I was there, looking at the images of events that he was part of. The time we spent there also gave me a welcome, and perhaps much needed, slap of perspective. What do we have to complain about? Really. As we ride along and we have a few challenges here and there and a few difficult things to deal with occasionally, big deal. What can we possibly complain about when compared to the conditions and events the people faced day after day, year after year, during that time of conflict. The things we deal with don’t even rate a mention on the scale of trifling, trivial, blips of inconvenience. It was good to have that dose of perspective. 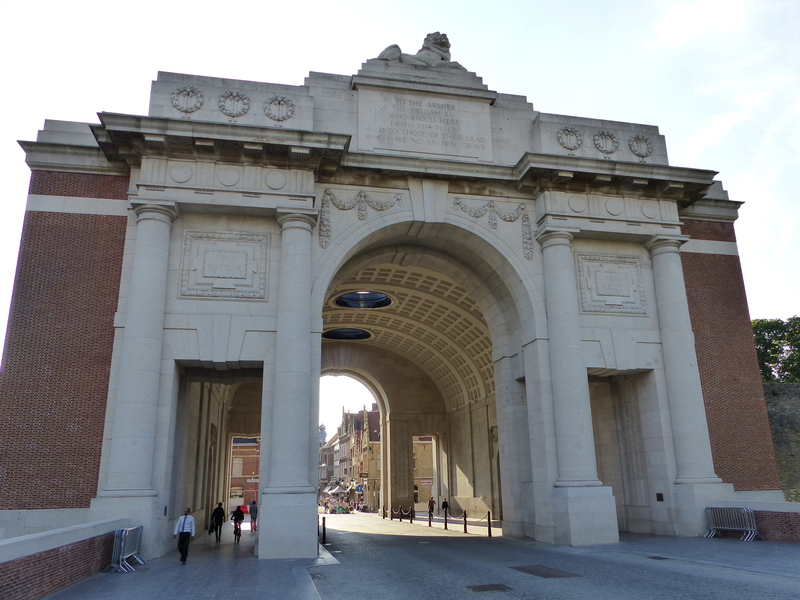 After time spent at the museum, we strolled around the streets, looking at the beautiful buildings and surroundings, then walked up to the Menin Gate, the monument to the allied forces who had fought in Belgium. 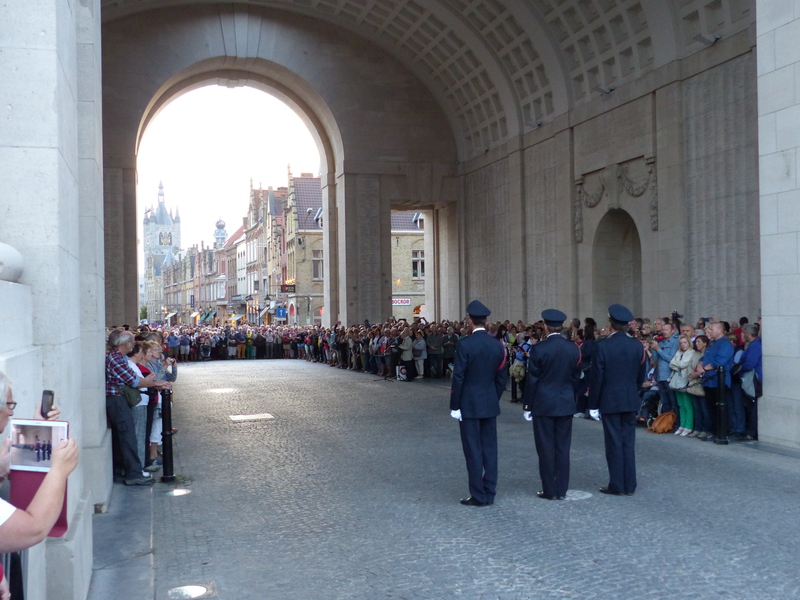 After a bite to eat in our room, we started walking up the street again to position ourselves at the Menin Gate for the evening Last Post Ceremony. 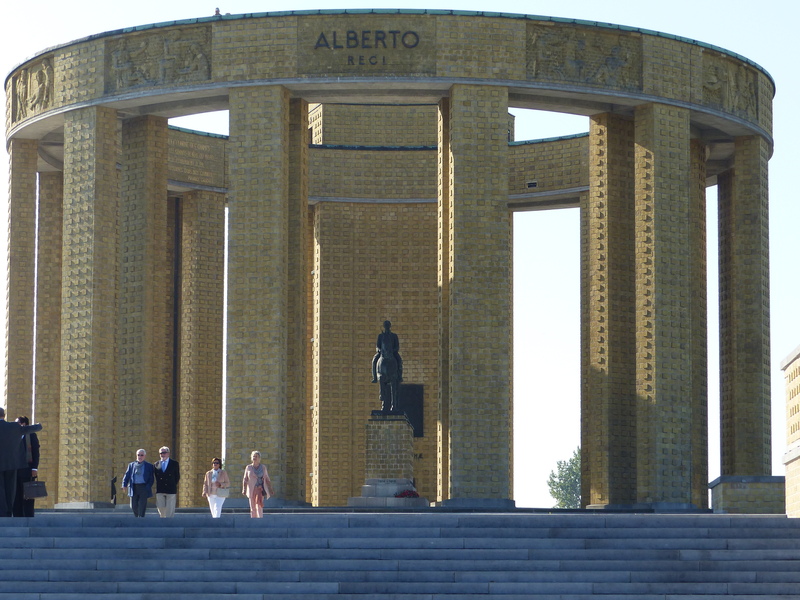 This is held every evening in Iepers, where The Last Post is played, along with a wreath laying ceremony. It was so moving, to be standing there under that great arch, with the evening light enveloping the city buildings, while listening to the trio of buglers playing The Last Post. I stood, head down, still, with goose bumps covering my skin, and let the emotions that piece of music evokes, wash over me. It was another day of learning, thinking, reflecting and gratitude. 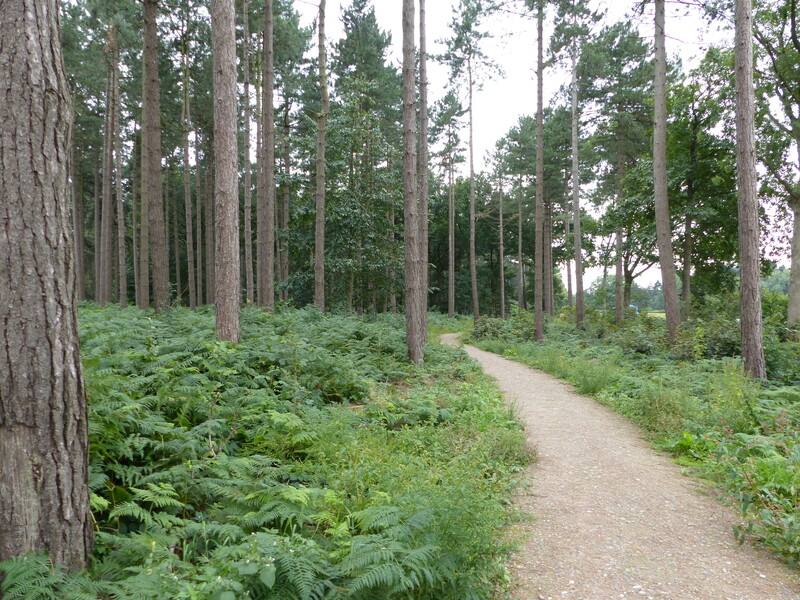 The cycle route was terrific, from the scenery, to the path and the opportunities for learning along the way. I feel like what we saw and experienced is beginning to conclude the story for me, the story we began on the battlefields of France, that added chapters to the story we had brought with us. This trip continues to take us to places that are meaningful inside and out. 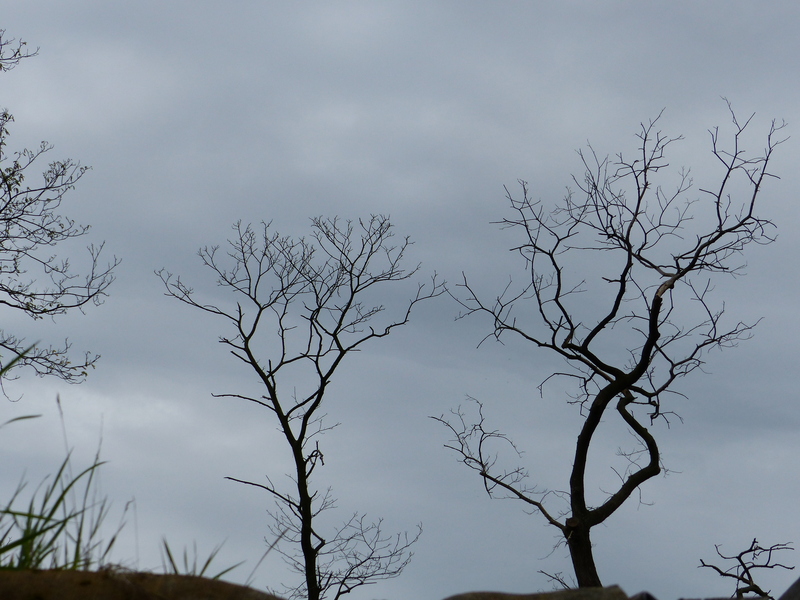 The stories continue, the landscape changes, and I change along with it. It’s moving, it’s meaningful and it’s…magic. 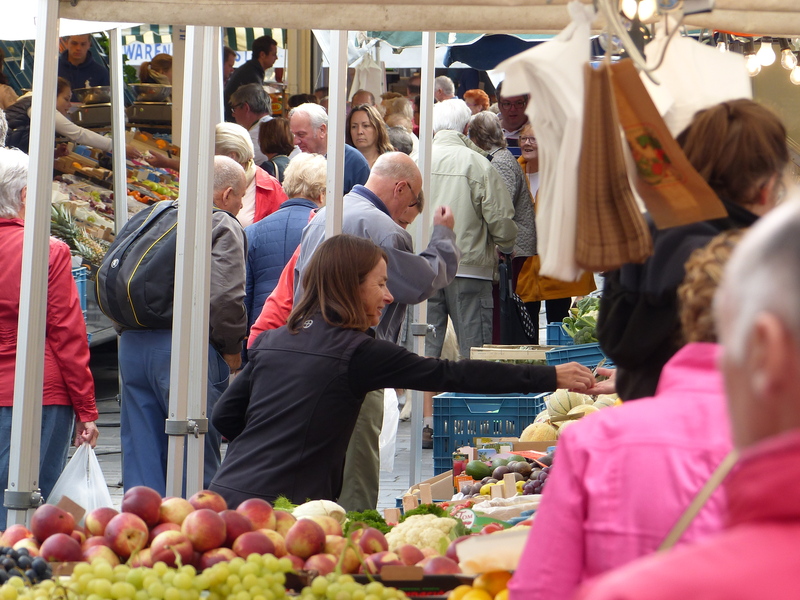 Market day in Iepers. The stalls were colourful, the stall holders were in full voice and the market goers were in abundance. I joined their ranks as we prepared to ride out of the city and walked the stalls in search of elevenses produce. With a mixture of English, Dutch (I haven’t mastered the dialect of Dutch that is the Flemish language, so I just stick to Dutch), hand gestures and some pointing, I was able to communicate my desired purchases to the very nice lady behind the stall, who filled bags with my fruit and veg and I walked away with supplies for the day. As I was attaching my bags to the bike, an older man walked past and looked closely at my bike. He said something I didn’t understand, followed by, “special velo?” which I did understand. “Yes,” I said, because I guess it is a special sort of bike. He laughed, with a pfffft and a flick of his hand, as if to say, “you’ve got to be kidding, no thank you!” and walked off with a smile and well wishes for us. Love the chatty people! The first stop today, was to be The Passchendaele Museum in Zonnebeke, for some more learning about the First World War in this region. 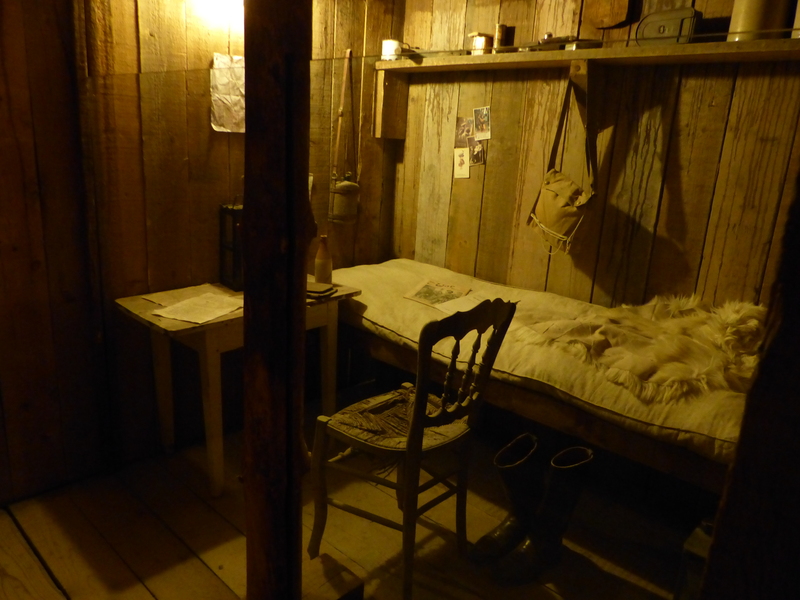 After a short ride, we came to the museum, tucked away in the small town of Zonnebeke. Passchendaele is a name that represents everything that is horrific about warfare. We walked around the museum, which gave information about the battles and the different allied countries that had fought in Belgium and Passchendaele specifically. As we walked into a room of exhibits, what should we hear? It was Slim Dusty singing Waltzing Matilda! This played as we walked around the information about Australian forces and I had to smile when the next song came on and it was a very cultured British voice, singing something very classical and refined. It seemed, a classical piece is played to represent the British and what does Australia get…Slim Dusty! 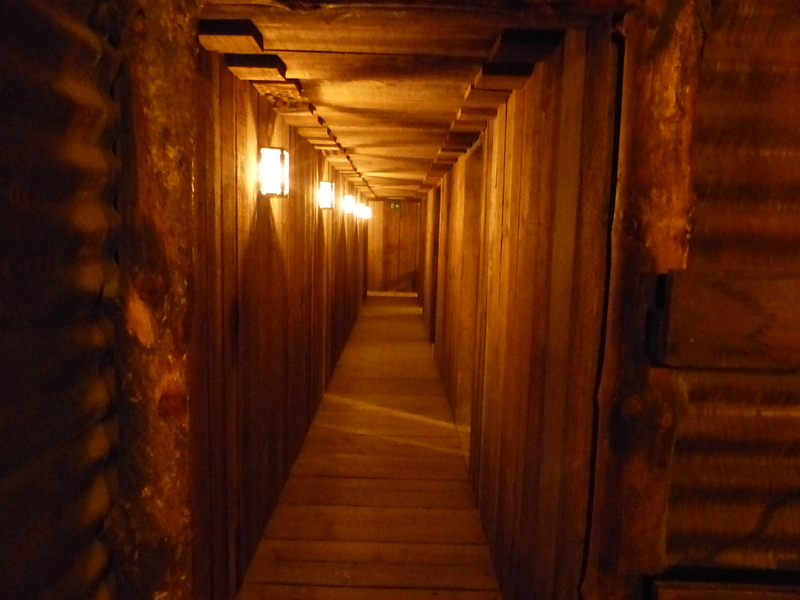 The museum continued outside where we were able to walk through trenches and into dugouts, where we got a sense of the space and conditions the troops experienced for years, with the constant drone of shellfire permeating the walls. It was another moving and learning experience and turned another page in the story for me. 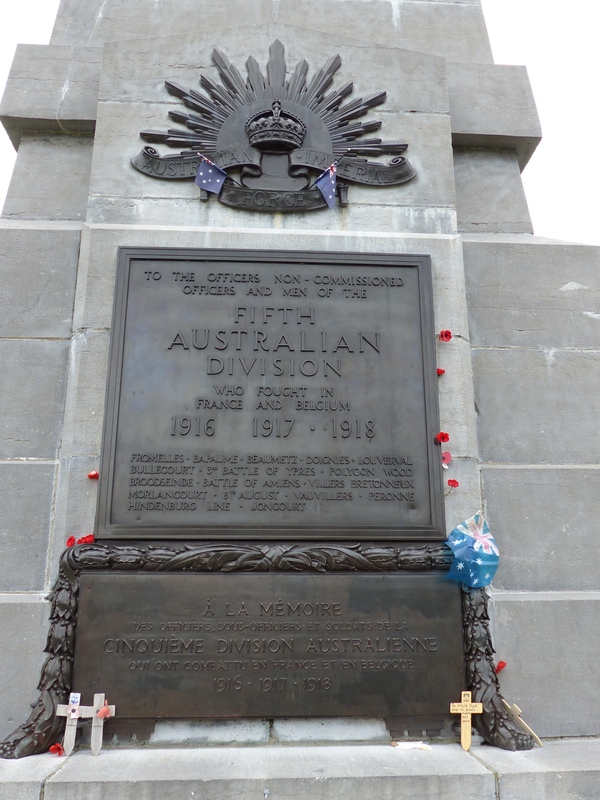 I knew my grandfather fought here, so we rode on to Polygon Wood, the site of fierce fighting and where the Australian 5th Division, of which my grandfather was a member, stood against heavy enemy artillery. 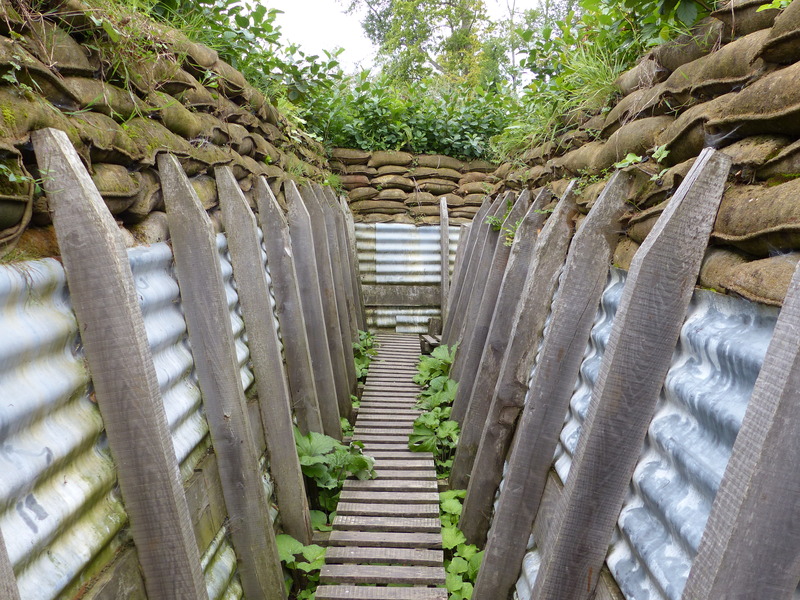 On September 26, 1917, under immense bombardment, the Fifth Division advanced in the face of fierce resistance and one by one, they captured pill boxes and strongpoints and Polygon Wood was secured. 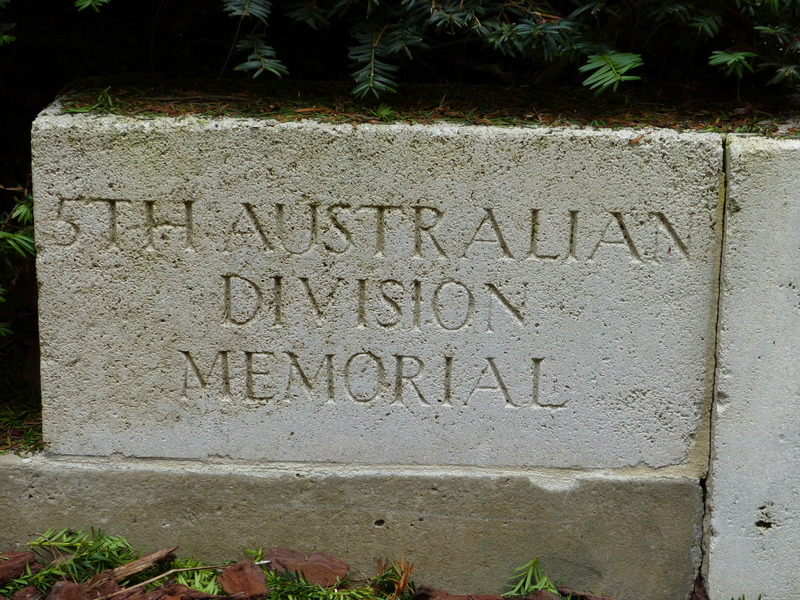 Despite heavy casualties, the Battle of Polygon Wood was the Australian Fifth Division’s most decisive victory on the Western Front. 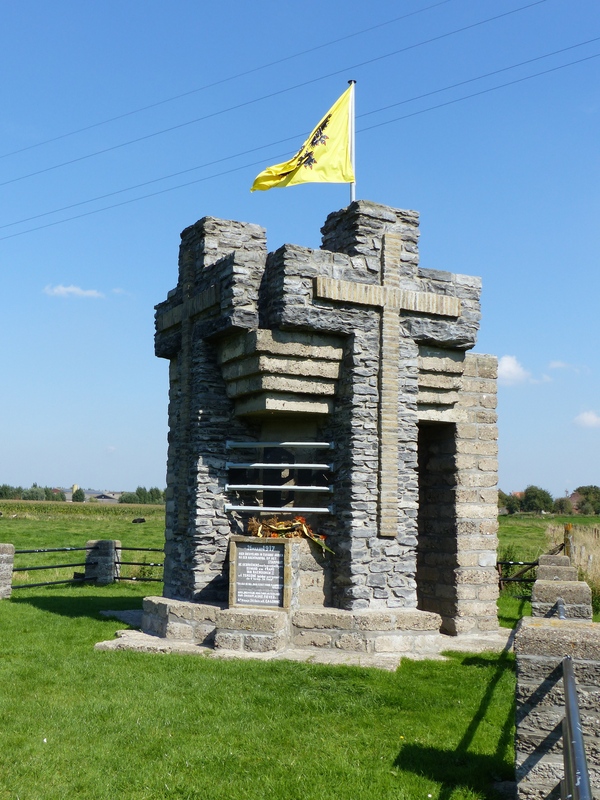 In the 1920’s a memorial to the 5th Division was constructed on the site of the battle and we rode on to see the location and the memorial. 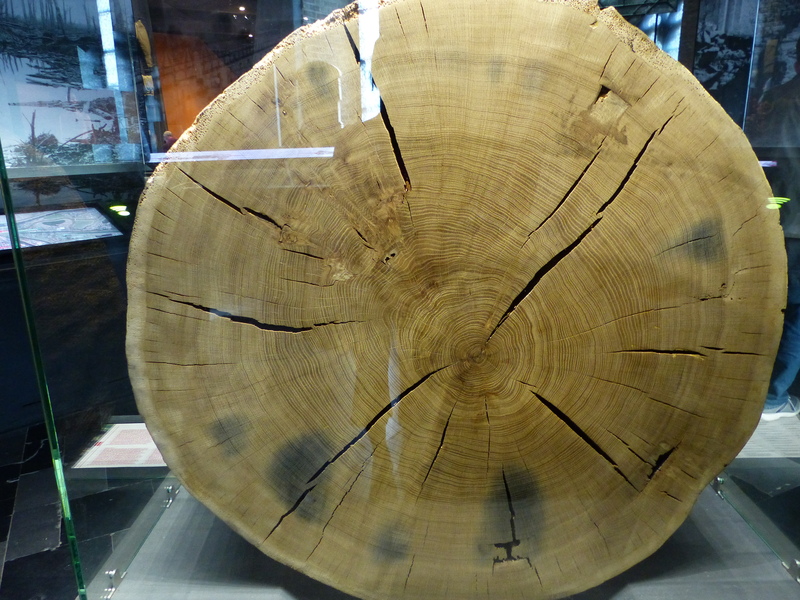 The wood is still very much there, thick and regenerated from its century old destruction. 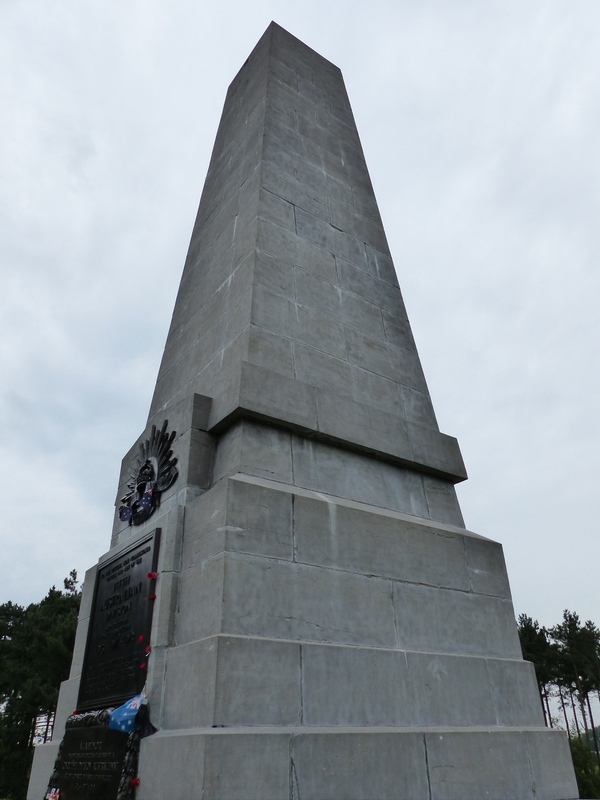 The monument stands alone, high up on the hill, overlooking the wood and the British cemetery. It was a place I was so glad I was able to visit. It was very special and I felt very privileged, as one of the few people, who can say they knew someone who fought in the Great War. My grandfather wasn’t just a face in a photograph, he was my Pop and I knew him until he died when I was a teenager. I’ve been able to see him in photos as a young fella and I knew him as an older man and we’ve now been able to visit most of the places in France and Belgium, where he lived through the horrors of the First World War. I feel like I’ve now been able to connect the young face, to the man I knew and the events he experienced on foreign soil, so far from home. 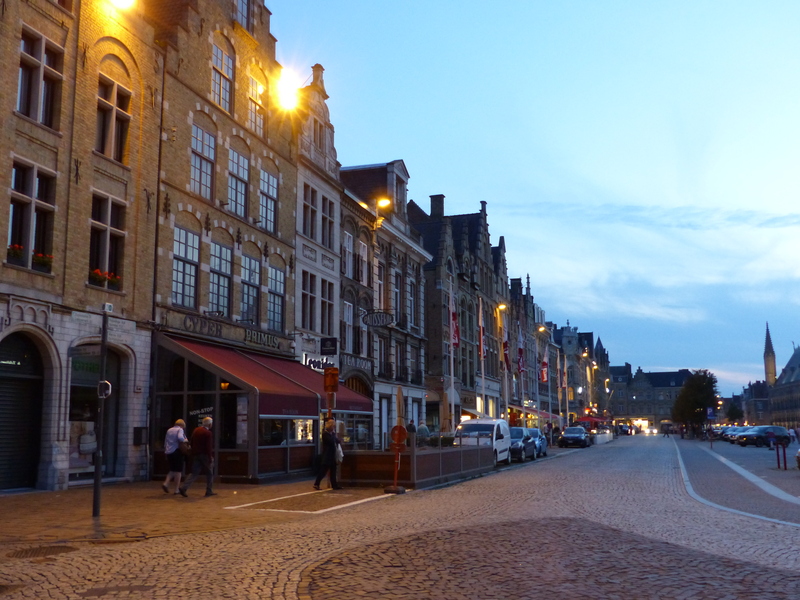 We rode on to Menen, our pit stop for the day. We’d had some trouble finding accommodation and sat up until the late hours last night, trying to find somewhere, so it was a case of taking what we could find. What we found was a very friendly and accommodating Best Western in Menen, who housed our bikes for us and gave us a nice, big, warm room, out of the spattering of rain that had just arrived. Today was another very special day. We rode through past battlefields and I feel like I continued the story of the Great War and my grandfather’s chapter in that story. Our learning has been never-ending in so many different ways and today added to those layers of learning once again. The ride was nice, out of traffic which allowed us to look around, take in our surroundings and enjoy the Belgian landscape again. We even had some hills today! They weren’t big hills or hard hills, but they were definitely hills! It was a nice reminder and transition back to the inclines that we will face again, once we leave this area. Another wonderful day in the pot. A special day. Another day of learning and thinking. Thinking about the present, thinking about the past, thinking about those who have gone before us. Oh, Heidi, what a special day! It must be so moving to be walking in the footsteps of your grandfather in the freedom that they fought so hard for. Pete also had two great uncles, one on his mother’s side and one on his father’s, who fought in the 5th Division. They were also in Polygon Wood and both died and are buried within a couple of kilometres of each other just out of Ypres. Lest we forget. Yes, a very special day. What a connection between my Pop and Pete’s great uncles, all being in the 5th. Does he know what Battalion they were in? My grandfather was in the 54th. Today’s post was a very moving one, so happy for you that you travelled in your Pop’s footsteps. It was a special day. I just kept thinking of the distance we’ve travelled around those different battlefields across France and Belgium and how those fellas moved from one awful place to another and another across those countries. It was a good reminder to be a bit more mindful of the fact that my idea of a hard day, is nothing!